When Alicia moves back to Pine Valley to help her mom through a serious addiction, the last person she wants to see is her teenage crush, Jeff Finch, who destroyed their friendship in one single disastrous night. But Alicia is determined to not let anything about Jeff affect her, especially since she hasn’t seen him in ten years. All she knows is that he’s living a successful and charmed life, and she is more than happy to keep anything between them in the past. But when he shows up with a date at the restaurant where she works, Alicia realizes she’s still not over her feelings, and Jeff is definitely looking at her in a way he never has before. 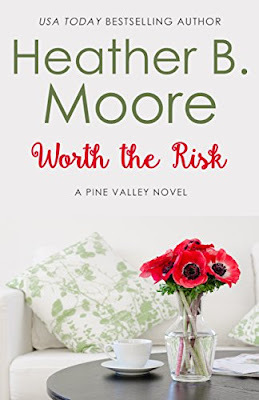 I really love that Heather B. Moore is writing a contemporary romance series. She is such a versatile writer and I love how she can always surprise me with a new genre. I have to say first that I really love this cover. I love it's simplicity and the pretty pop of color. I can't wait for the next book releasing in April! Yay!